In 1982, Pope John Paul II visited Britain. It was hoped that he might visit Walsingham, but such a visit would have been a logistical nightmare for the Shrine authorities and the Norfolk Police. Instead, the statue of Our Lady of Walsingham was taken to London, to Wembley Stadium. The Holy Father insisted that it remain on the altar during Mass. 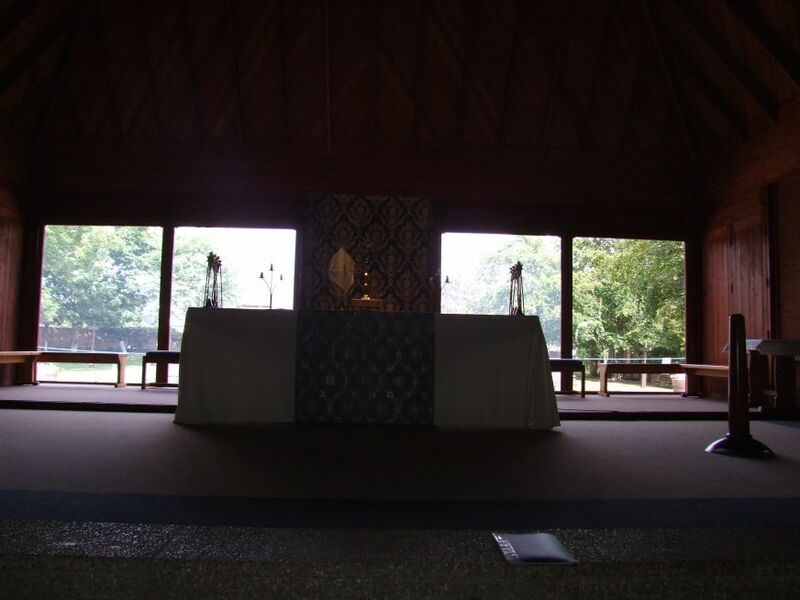 If Pope John Paul had come to Walsingham, he would have found something extraordinary. Here, in these remote Norfolk fields, work had just been completed on one of the largest 20th century churches in East Anglia, the Chapel of the Reconciliation. It was built in a Norfolk vernacular style to accomodate the thousands of pilgrims who make their way here each weekend in Summer. 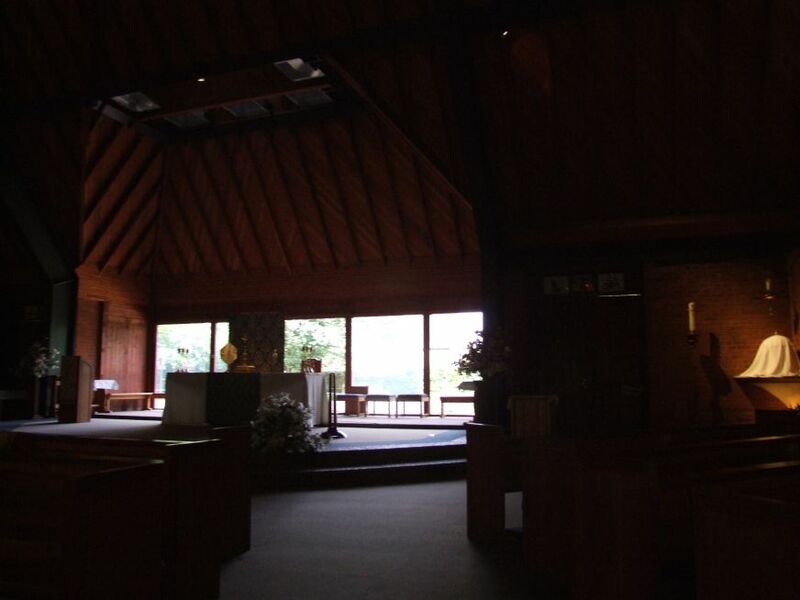 Even then, it is not always big enough, and on really crowded occasions the wall behind the sanctuary can be removed to create a church in the round, half of it out of doors. 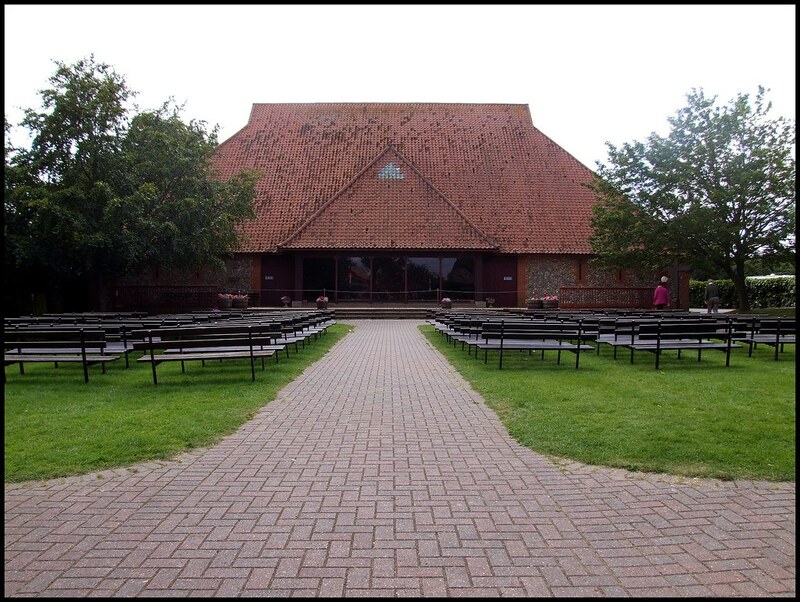 The effect is similar to that of Snape Maltings in Suffolk. 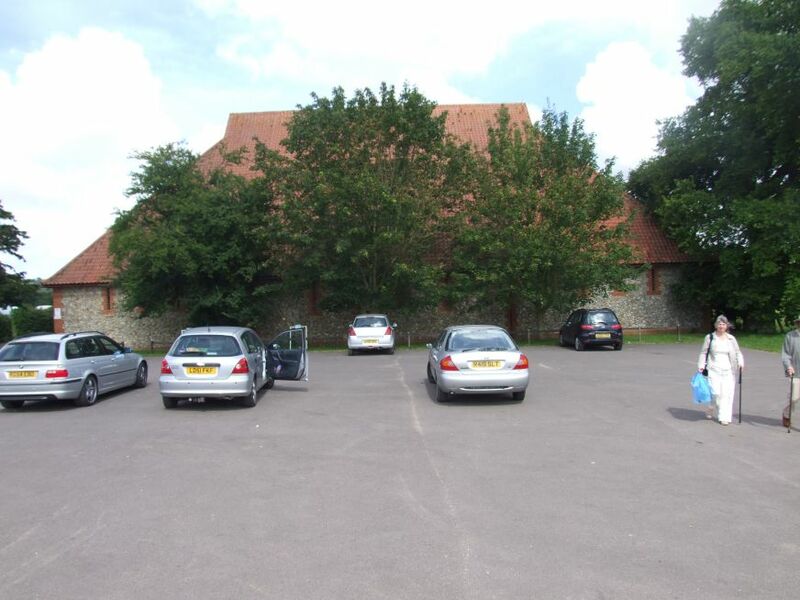 Seen from a distance, the high-roofed church appears to be a great barn, only the car park beside it, and the huddled campus of shrine buildings, suggesting that here is something a little out of the ordinary. The architects were Michael Wingate and Henry Rolph. The roof comes down to within a few metres of the ground, and you enter the building through narrow doors at either end. Inside, steel and wooden beams lift above the open space, deadening the sound. 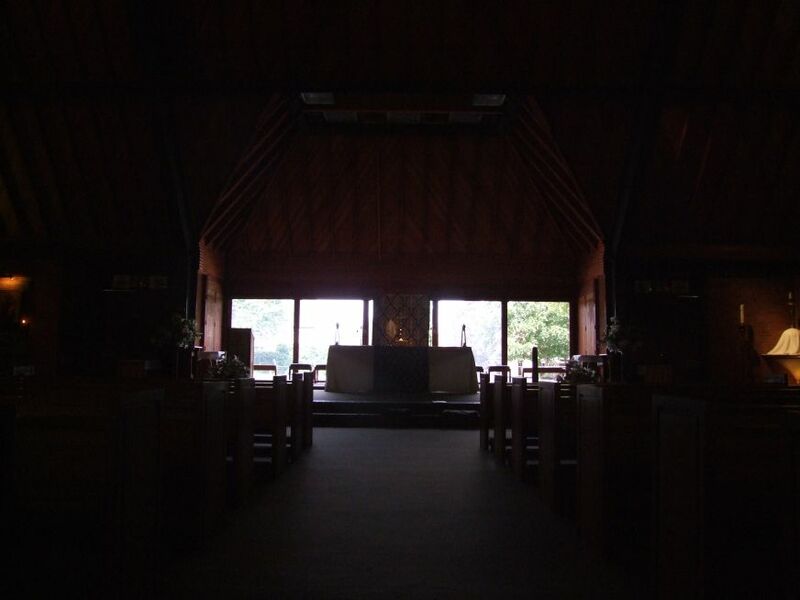 There are no windows, except those behind the altar. On a sunny day, it can take a few moments for your eyes to adjust to be able to see anything at all. The sheer size of the building, and the darkness, make photography rather difficult, and it is sadly now discouraged in any case. An icon of Our Lady of Walsingham stands against the wall on the left of the sanctuary, the organ rather awkwardly against the wall opposite. The silence can be overwhelming if you are here on your own, but when it is filled with a thousand or more pilgrims lifting their voices in song, the atmosphere is utterly charged. It can be an intense and emotional experience. Outside, afterwards, the birdsong and the sunshine are an appropriate counterpoint. Behind the church are the shrine gardens. A Way of the Cross formed from the 1948 student crosses leads to the 14th century Slipper Chapel and the 1938 Chapel of the Holy Spirit. Beside them are the cloisters of the 1980s, containing offices, a shop, a café and toilets. In the centre of the cloisters is a fountain surmounted by the font from the redundant medieval church of Forncett St Mary. Today, hundreds of pilgrims use it to fill their bottles with holy water to take back to their distant parishes and homes.